Benjamin Zander ever strives, and more successfully than most, to proselytize for the Kultur we love. 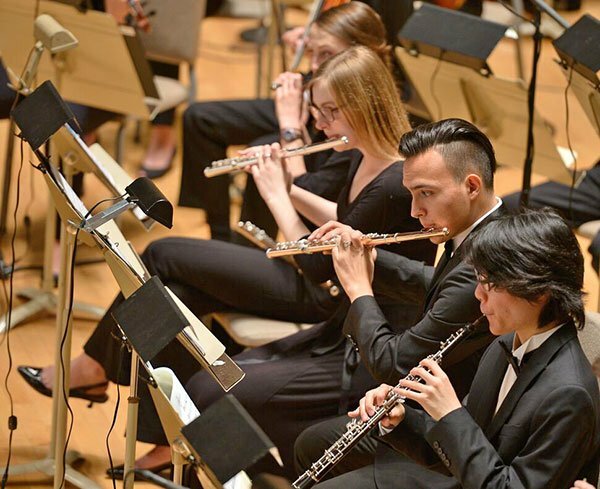 At a capacity Symphony Hall on election eve, at least half of the attendees constituted something other than parents, grandparents or siblings of the Boston Philharmonic Youth Orchestra players. Classical music newbies, at least according to the silver-maned marketing guru, to a person, these accepted his admonitions about concert etiquette. There were no coughs in quiet parts, no cellphone rings, no clapping between movements. But beyond all that, we shared in the rapturous quiet of an attentive concert hall (before flu season), something you cannot experience in front of a screen at home. The conductor’s latest experiment in outreach took the form of a blue screen (not of death) which hung with bland expectancy over a dark stage illuminated by stand lights. When snarling brass announced the opening of Sibelius’s Finlandia, the screen suddenly brightened with morphing triangular megaphones, as Music:Eyes assumed the roles of interlocutor, tourguide, and visual explicator. With but two dimensions to engage us, the basic plan became immediately apparent. Frequency went from bass at the bottom to treble at the top, and time marched from right to left in the Hebrew manner. Edge qualities of various circles and polygons represented timbre, while color and brightness conveyed broader affect. At its best the presentation highlighted inner voices and let us anticipate entrances. At its worst, in tuttis, it looked like a perforated player-piano roll scrolling sideways. Music:Eyes constitutes but another passing attempt to make music visible. The genre perhaps began with Scriabin’s synaesthetic color organ. Paul Klee’s painted embodiments of sound (listen to Gunther Schuller working backward from light to sound Here), oscilloscope traces, Disney’s cartoon fantasy of Bach, magic eye cathode ray tubes, rock concert lightshows, and computer media player visualizations come to mind as other progenitors. This presentation cut a style of 1950s Formica quaintness. [See example here.] It might have impressed more had the screen been bigger and the show better integrated into the larger concert. Could an expert recognize the composition depicted? Quite possibly. Did it add to anyone’s enjoyment of a strong performance? I think not. The Andante Sostenuto introduction of the national hymn sang with great intensity from the start, and at a not-too-slow tempo. The high dynamic contrasts came off well and the powerful brass of the orchestra gave out rhythmic precision and fine tones. The wonderful lines of the lower strings convinced with their rich and homogeneous sound. After the spiritual choral, where the orchestra successfully transported the composer’s message of hope, the glorious finale swept us away. Due to its unique Scandinavian-infused post-Romantic style, and with the help of some major advocates such as Heifetz and Oistrakh, the Sibelius Violin Concerto stands as one of the most important violin concertos of the 20th century. 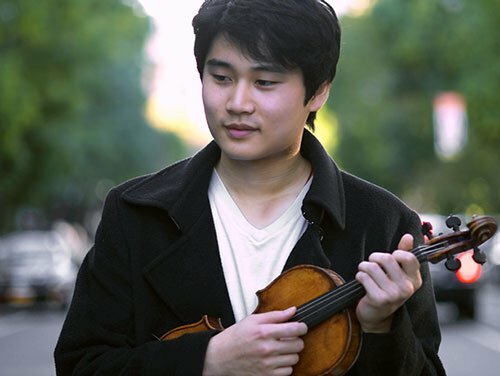 Perfectly focused con sordine pianissimo shimmers from the entirely unified upper strings welcomed the entrance of an astonishing adept: the 21-year-old Korean violinist In Mo Yang, First Prize Winner of the 2014 Concert Artist Guild Competition. Taking the dolce ed espressivo notation quite literally, he combined patrician irony with an outgoing Romantic impulse to propel him through episode after episode with the swagger of a master. Brilliance and quieter colorations alike sounded inevitable in every moment. Yang may be close to singular in having so early reached a mastery that takes him beyond technique into artistic realms. The BPYO’s hand in glove accompaniment felt all the more unaccountable because Zander mainly beat time. The dynamics and shaping must have been achieved in rehearsals, because they arched seamlessly, with few indications. Sibelius demands that the upper strings count a lot of rests in this concerto, so that the soloist never has to compete with like. Solo turns and sectional coloration from brass and winds conveyed a full measure of the composer’s intended punctuated equilibrium. Contributions from oboist Andrew Port and bassoonist Ryan Turano made lovely weft for Yang’s gleaming silver warp. Movement three commenced with a gallop as if before a golden carriage, taking care to arrive at the ffff destination with no scuffs on the polish. Yang took the most famous part of the whole concerto with all the excitement of a young steed. He did bend the tempo to its maximum, but Zander and the BPYO supported with firmness and stability. Yang’s flawless technique, artistic temperament and elegant, warm tone will not soon depart from our memories. For an encore Yang set off brilliant fireworks in Paganini’s first caprice, transcendent technique permitting surpassing expression. Avoiding political freight while dancing around nationalistic and fascistic contentions found Zander describing Prokofiev’s triumphal Fifth Symphony as a journey from darkness to light which he encouraged all in the room to take. The composer himself had some issues with shifting alliances, having almost been shot for his sinister depictions of Germans in Alexander Nevsky—that is, until they became enemies again. In a what’s-in-a-name juggling and recycling of motivic loyalties, Capulets, Montagues, Russians, and Germans all contended yet again, but this time in a concert hall and not on a frozen lake. Teufel adds his thought that the orchestra showed great rhythmical energy and a dense and intense sound in the first movement, Andante. “The perfectly planed accumulation toward the end of the movement lead to an almost violent tone, that provided the perfect musical picture of the imaginary battleground. “The Allegro moderato unfolded in a dancelike manner and offered a kaleidoscope of different colors and sounds. The syncopated notes were splendidly articulated, which helped to bring out the cynically grotesque and militaristic character. Great intensity and angelic lyrical lines defined the Adagio. The final movement masterfully brought out the giocoso character through clear articulation and wonderful rhythmical control. What a showpiece for orchestra and conductor this symphony disclosed, from massed tuttis to delicate exposed lines. Oboist Ryoei Kawai, bassoonist Jensen Bocco, pianist Richard Rivale, tubist Frank John, flutist Carlos Aguilar, piccoloist Hayley Miller, and trumpeter Elmer Churampi all pleased the grateful spotlight, and the percussion section brilliantly managed everything from projectile launching to sedate dancing for soldiers on leave. I had to keep asking myself in what ways this spectacular ensemble fell short of major orchestra standards, but in the afterglow of an unbelievable achievement from every section and every soloist, that will have to remain an unanswered question. Meanwhile, much gratitude to all for this small miracle of appeal to our better natures. Bravissima peetie…omi and Babba would have been so happy to have finally a musician in the family. And of course that goes for us too. I think I am not the only one who noticed how Inmo played with true genuine nature. I could feel his humble nature come through his playing. I am a cellist in BPYO, and he truly was one of the best soloists I have played with. As a proud BPYO parent for three-plus years, I’ve heard this orchestra many times, but I thought this Prokofiev was their most remarkable performance yet. It was satisfying in every way, and I was sad when it was over. A special highlight was hearing 17 violas playing the catchy tune in the Trio of the Scherzo (and, no, my daughter isn’t a violist). I haven’t been able to find a professional recording to match the glorious sound they made in that moment, and watching them grinning and moving about naturally just added to the experience. I had heard the overpowering ending of the first movement in much smaller rehearsal confines the night before and it was unbearably loud; three conductor’s assistants sitting at a table behind the conductor all had fingers plugged into their ears in anticipation! But Symphony Hall was made for music like this, and it was glorious. As someone who generally loves the idea of visualizing music and building this kind of enhancement into *some* performances venues, I found it oddly unsatisfying to have the Finlandia visualization in this context, although it was cleverly designed. I think partly it just wasn’t a good visual match for the hall, and I also found myself not being present enough with the sound of the live orchestra when I was watching the screen, although perhaps if I didn’t know the music well, I might’ve found it helpful. I ended up just watching the conductor/orchestra after a couple of minutes, but I do think this kind of technology could be really useful in more informal contexts. I was amused/confused by your comment about time marching “from right to left in the Hebrew manner” – the virtual notes were certainly arrayed in the standard left to right direction one finds in music notation, but “time” stayed dead center, so it was more like reading music (or text) in which the page constantly moves to the left so that they eyes never need to scan right.